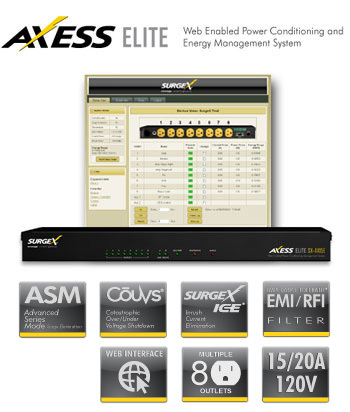 SurgeX is the leading manufacturer of premium AC power conditioning products for the professional and residential audio, video, and multi-media marketplace. Our patented technology is built exclusively to properly protect ProAV and home theater equipment from AC surges and electrical transients that can disrupt sound quality and digital performance. SurgeX offers a complete line of AC power solutions for protection, power conditioning, and control of sensitive electrical and electronic equipment, especially today’s DSP- and microprocessor-based equipment. SurgeX products are designed to suit every application and are offered in stand-alone, rack-mount, and NEMA enclosures. In addition to producing the most effective power conditioning products, SurgeX offers the most comprehensive applications support available. Through key relationships with other industry experts, we have become a source of knowledge and assistance for all AC power and grounding issues, not just surge elimination and power conditioning. Our senior staff are all SynAudCon graduates with extensive experience in the professional audio/video industry. Additionally, our chief engineer is a member of the InfoComm Faculty, a full member of the Audio Engineering Society and a member of the AES Standards Committee Working Group on Electromagnetic Compatibility. SurgeX is also a proud sponsor of SynAudCon, and a member of AES, NSCA and InfoComm. Based in the USA, SurgeX is a privately held division of Electronic Systems Protection, Inc. which develops and manufactures products at its headquarters in Zebulon, North Carolina.